This board is now on sale, and given the price we have adjusted the scores accordingly. 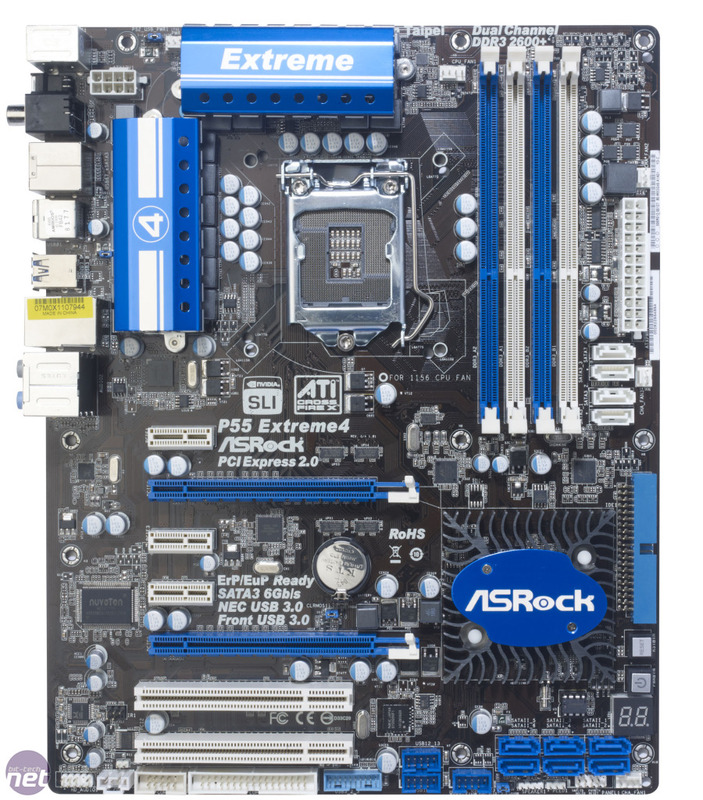 This is, according to ASRock at least, the world’s first motherboard with an internal USB 3 header. It can provide four ports of high-speed USB goodness – the usual two at the rear, and another pair via the large header and bundled front panel. However, things aren’t that simple, as the USB-IF (the controlling body for USB) hasn’t formalised an internal USB 3 header yet – ASRock has had to get creative. ASRock does say that it’s header design ‘is still following the USB-IF standard’ and pointed out that the board is bundled with a compatible front panel; even if the final internal USB 3 spec turns out to be different, you’ll still have USB 3 compatibility and speeds. The USB-IF confirmed to us that 'Intel has just completed a standard for the USB 3.0 internal connector, the USB 3.0 Internal Cable and Connector Specification 1.0... 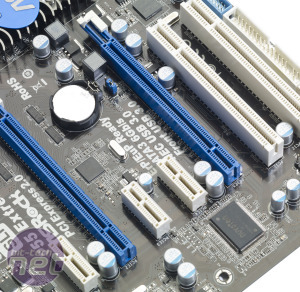 It appears that the ASRock connector could very well be based on the Intel specification.' 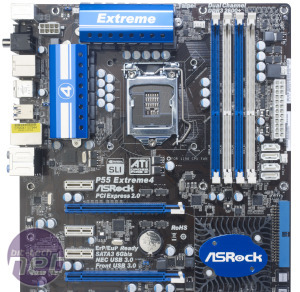 Elsewhere, the Extreme4 looks like a top-end LGA1156 motherboard for a fairly reasonable £120. 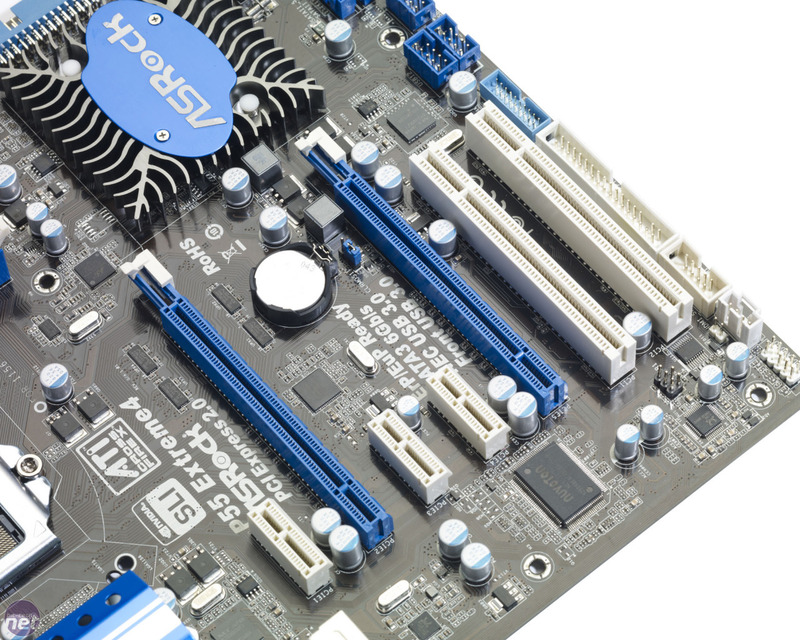 Looking around the board, there’s very little to dislike – there are two chunky heatsinks for the VRMs, a sizeable low-profile heatsink for the P55 chipset and great extras such as the Dr Debug POST code readout and the fact that you can mount LGA775 and LGA1156 coolers. The expansion slots are also arranged sensibly, with the two 16x PCI-E slots separated by two 1x PCI-E slots – even if you use dual-slot graphics cards for CrossFire or SLI (both are supported) they’ll have space to breathe. There’s another 1x PCI-E slot between the primary graphics slot and the CPU socket, and a pair of PCI slots below the secondary graphics slot. This means that you’ll have two 1x PCI-E and a single PCI slot free even after a pair of dual-slot graphics cards are installed, which is more than sufficient for most people’s use. The large IDE port is rotated to sit parallel with the PCB, and is well clear of any other connector, so it’s easy to route the ribbon cable neatly. 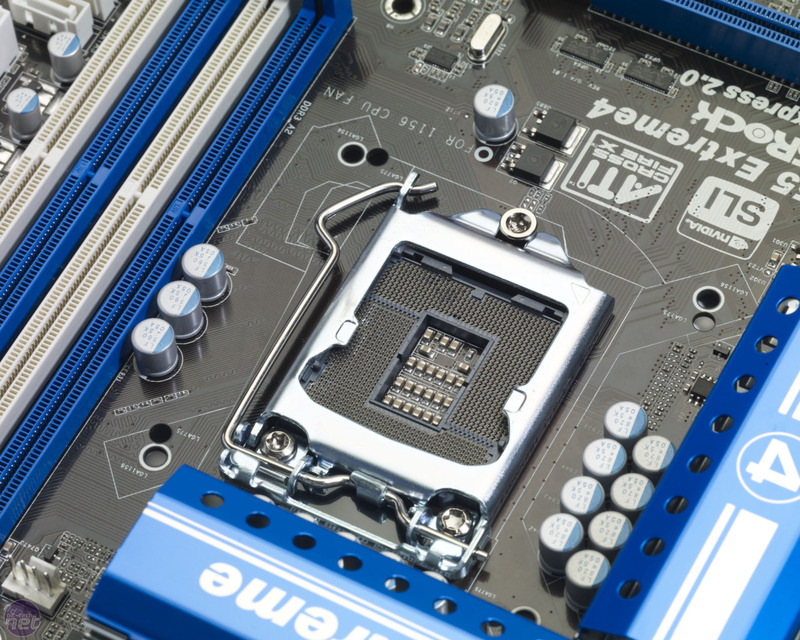 The ten SATA ports are mounted perpendicular to the PCB though, with the six blue SATA 3Gbps ports neatly toward the lower front corner and four white SATA 6Gbps ports placed near the 24-pin ATX power connectors and four DDR3 memory sockets. Both sets of SATA ports are at least easy to access once the motherboard has been installed, even if they’ll spout cables untidily. The on-board reset and power buttons are located to the right of the chipset heatsink and will be accessible unless you install a long card in the seconds graphics slot. The 8-pin EPS12V power connector is placed conveniently near the rear I/O block, which as well as the two USB 3 ports includes seven USB 2 ports (one of which can be used as a powered eSATA port). There are also two PS/2 ports, both types of S/PDIF to complement the six 3.5mm analogue audio outputs and a Gigabit Ethernet port. As well as all of these connections, there’s a clear CMOS button nestled between the S/PDIF and PS/2 ports. 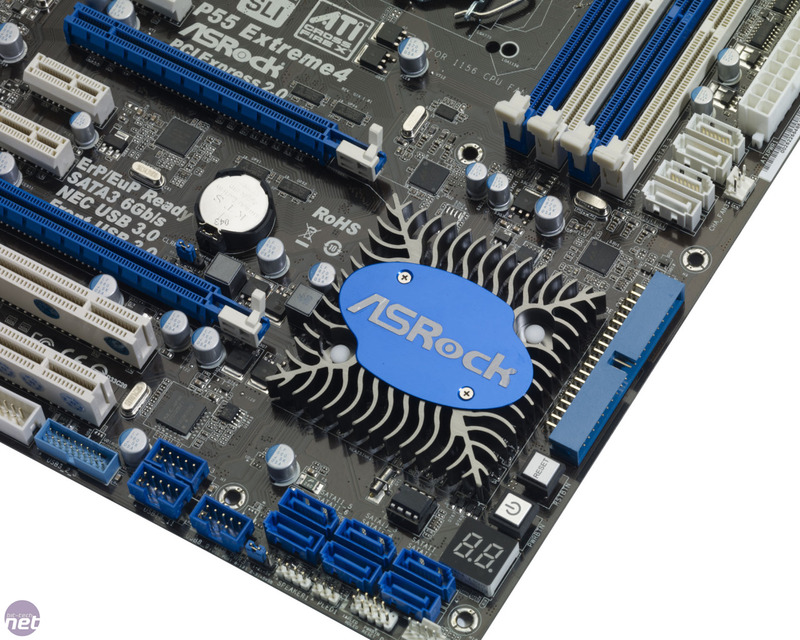 ASRock has enjoyed a bumper year, selling 8 million boards to become the third-largest manufacturer.